The date and the hills had been in the calendar for some time. I nearly did these hills in 1998 but we had to quickly cobble together a Plan B when we read on the gate that deerstalking was in progress on the estate. So we went and did Beinn Bhreac instead. Then some years later, my mate Alan told me how he had felt isolated when he did them, so far away and alone in the glen. As a Munro-bagger the hills have to be done but I can't say that I was looking forward to them at all. However one of my jogscotland running partners was up for a trip out so the die was cast. We would take the bikes to shave a couple of hours off the whole expedition. We left Falkirk at 6.30 am and were in the saddle by 9.10am! Pretty good going. 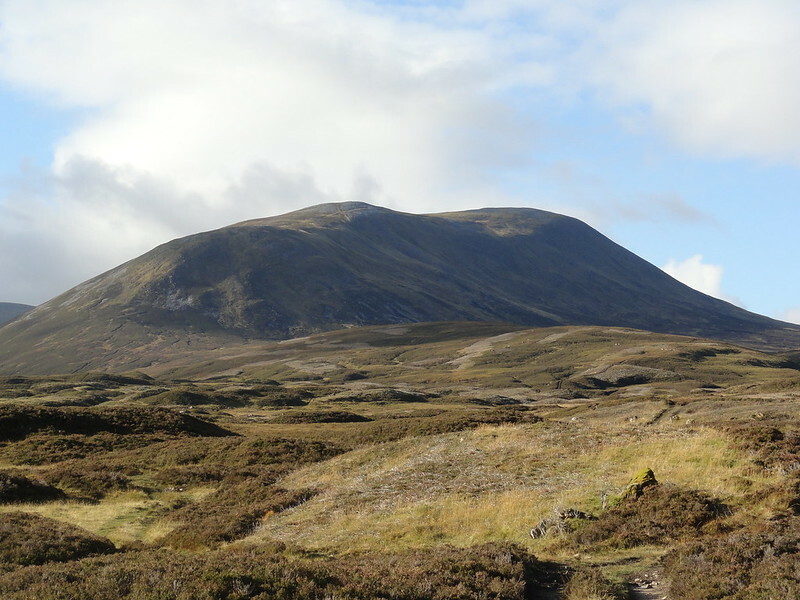 According to the Metoffice hour by hour forecast for Beinn Iutharn Mhor, it would be sunny until about 3pm, then high clouds, pretty chilly and a westerly breeze. This turned out to be very accurate. We had perfect views all day. The forecast hadn't mentioned the noise echoing round the glen - As soon as we got out of the car we heard the stags rutting and they never let up all day. We never saw them, niftily camouflaged in the brown hills but we saw two groups of hinds shying away from us, their reddish brown coat glistening in the sun. The track to the Altanour Lodge starts with a fairly steep climb which relents a bit by the time you get to the white wooden sign that says Col's Bed (a jaunt for another day) and then it's mainly flat and dry with a few up bits again past the second bridge over the Ey Burn. My head was hurting from the juddering on the track but on the whole it was a pretty good track. Watch out for the small enclosures which punctuate the shores of the burn. I assume they are connected to some type of regeneration but if anyone knows more, I'd be interested to know. 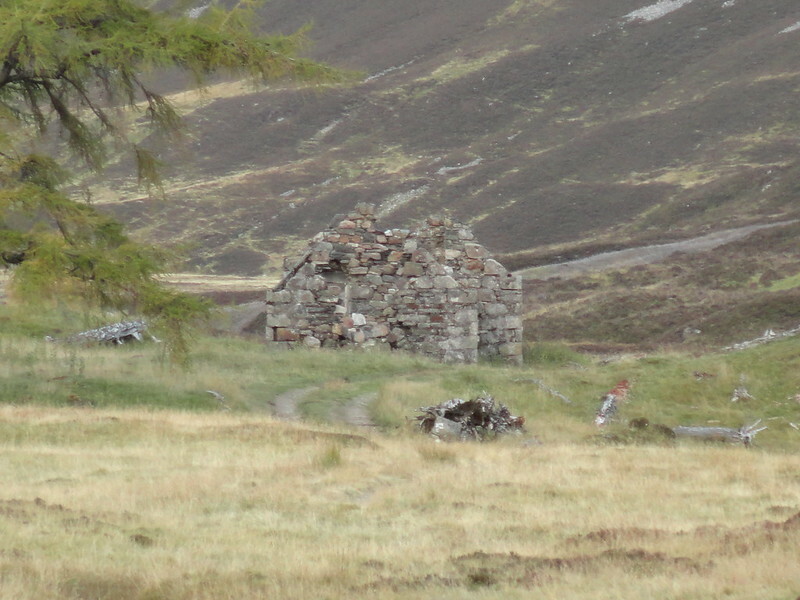 After about an hour we reached the ruins of the Altanour Lodge, cycled on for 200 yards and decided to leave the bikes in the heather. Our plan was to do the long tour of the hills - the weather was good, the visibility perfect and we had 10-11 hours of light for the whole route. We walked to the foot of Beinn Iutharn Mhor. There it was tempting to just climb up it's eastern spur and have it done, but that would have been cheating in such good conditions. 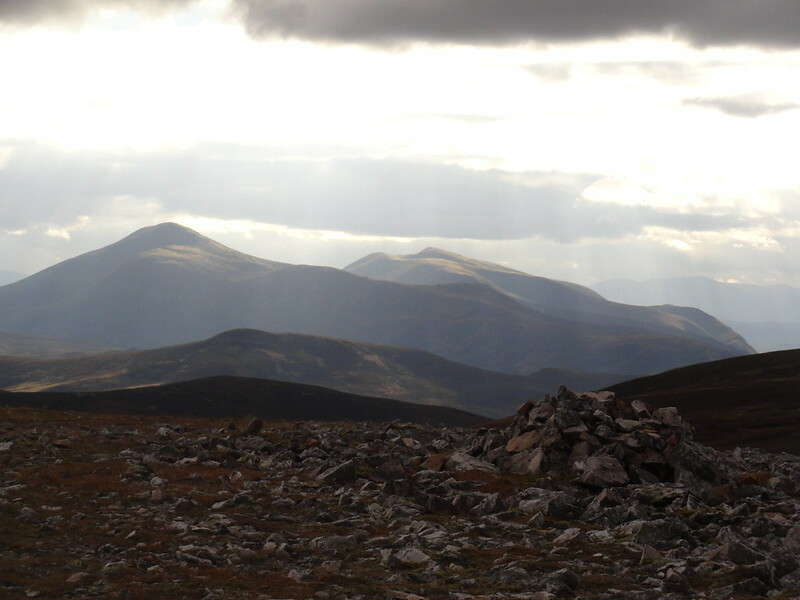 So we headed across peat hags, heather, and across the Allt towards the eastern reaches of Beinn Iutharn Bheag,. We probably should have followed the Allt instead but the lure of a path had been overwhelming! After a bit of hard graft we got to cairn of BIB and stopped for a view. Stunning! 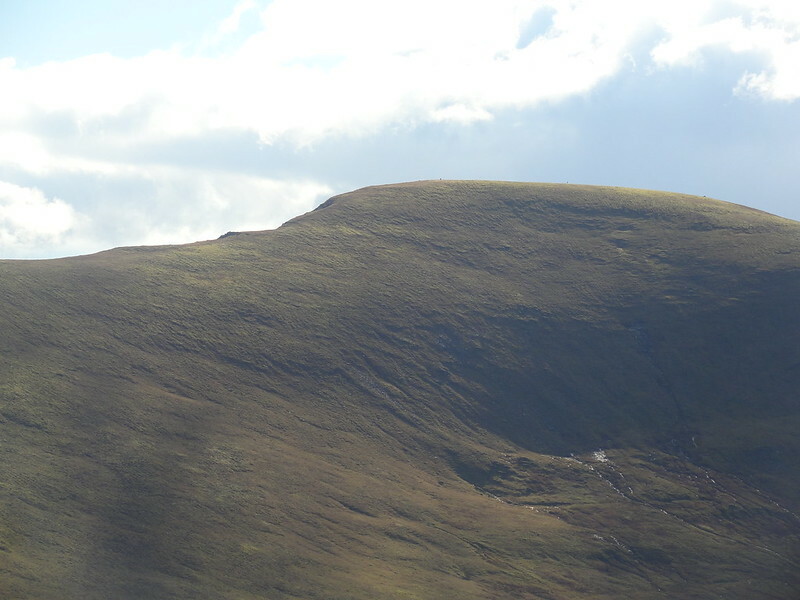 We could see the summit of BIM and knew we had a good 90 minutes of walking to reach it. So we set off again, stopping en route to admire beautiful Loch nan Eun glistening below, with barely a ripple to disturb its surface. In contrast we were walking against a fairly stiff cold breeze towards Carn an Mam. I'm glad we did this walk in perfect visibility. In a whiteout this would be a long, uncertain trudge. You think you're nearly there because the ground begins to flatten but you're not really. There's still a fair bit of easy ascent to reach a cairn which, inevitably is at the far end of a wide plateau. harrumph. 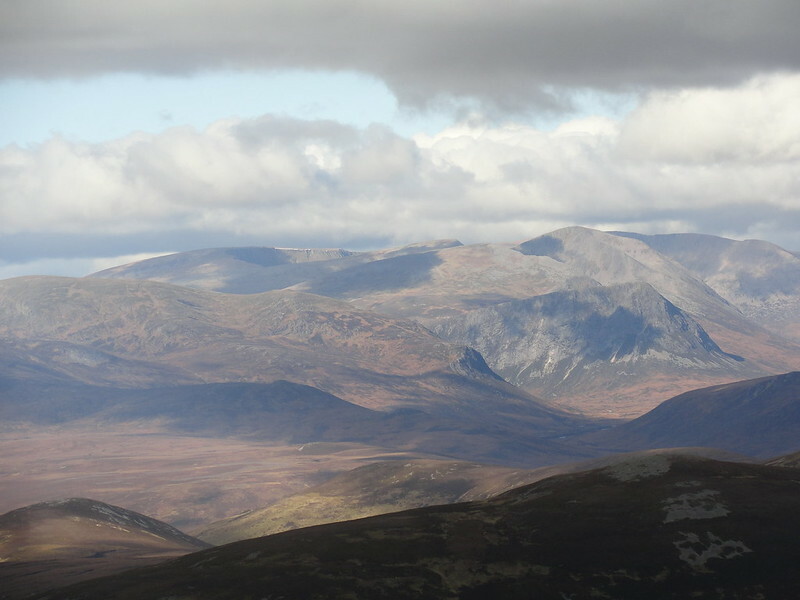 But today it was no bother - and the reward was great views in the south towards Lochnagar and in the SW of Glas Tulaichean and Carn an Righ. 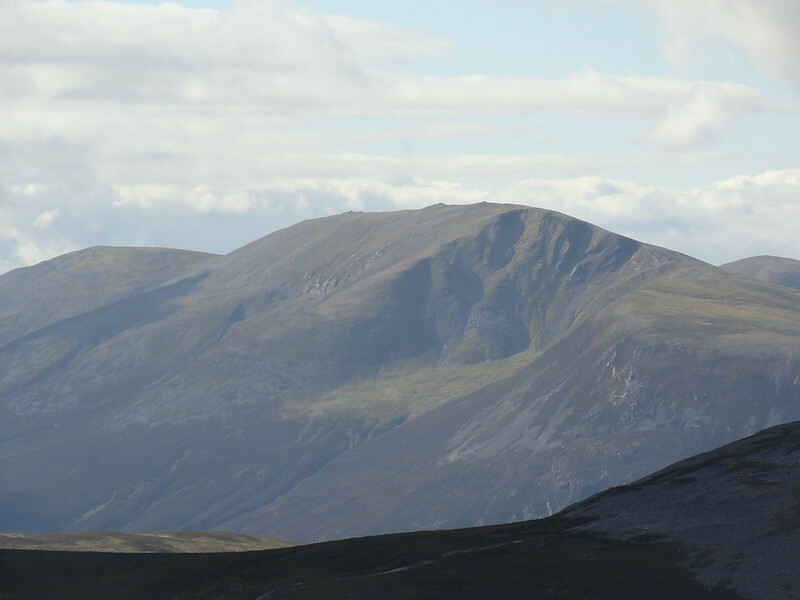 Was it the long snaking ridge of Beinn a'Ghlo in the distance? Yes it was. 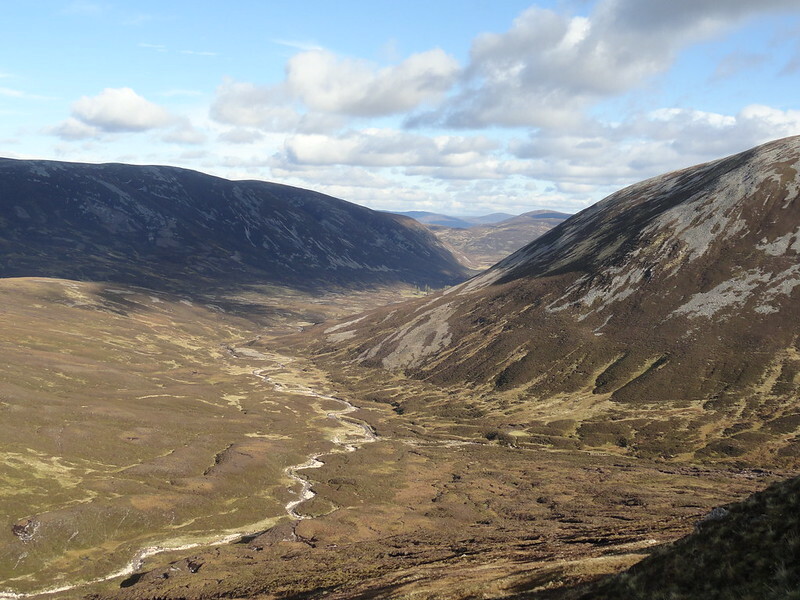 And to the north, the full splendour of the Cairngorms lay before us. More of them later. 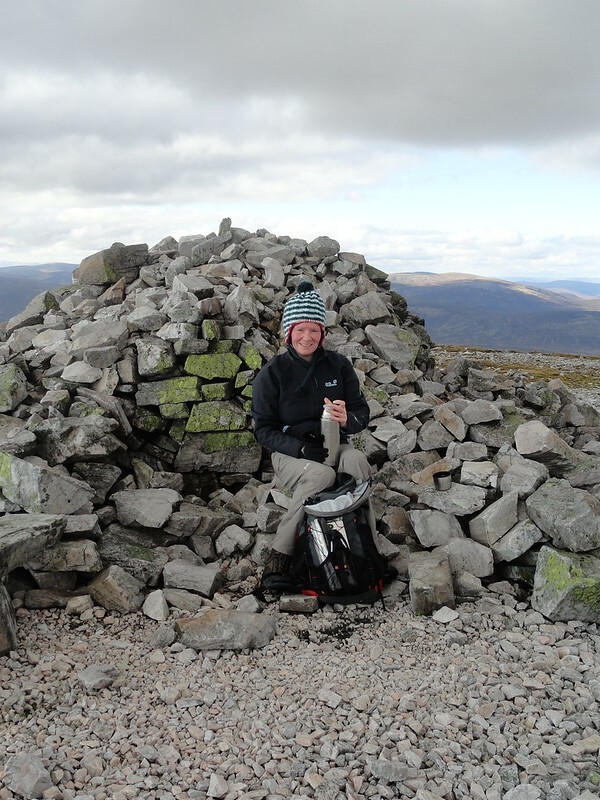 We were soon on our way towards our first Munro - it didn't take long (just over 30 minutes) and we sat in the shelter of the large cairn for a well deserved lunch of home made sandwiches and hot drink! And then we saw it - an eagle, with a huge wingspan, floating on the thermals just above us. It almost dove for a prey but thought the better of it clearly, as it unfolded its beautiful wings again to resume its riding. Fantastic. Sadly I didn't have a chance to take a photo and in any case I was just happy to gaze at the spectacle and photograph it with my eyes to store in the photo album locked in my brain. 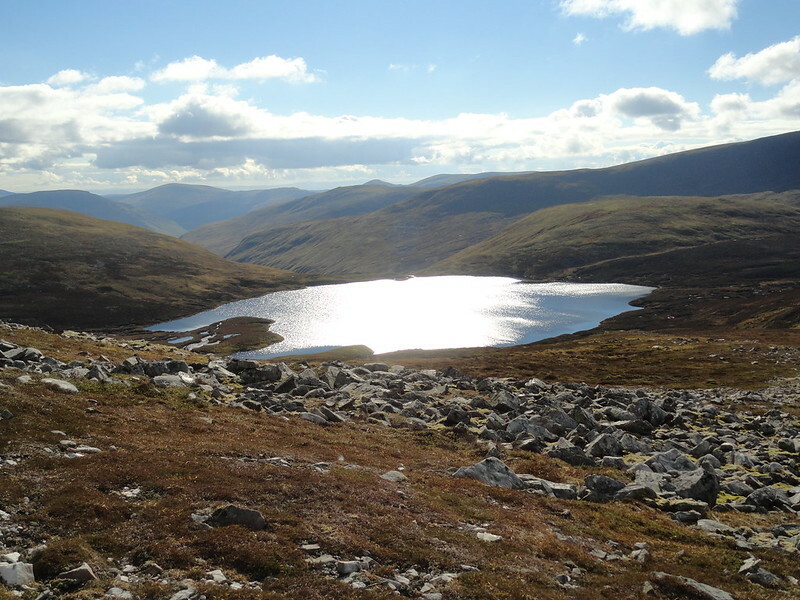 We set off again, eastwards along the ridge towards the other cairn (there are a lot of cairns in the Cairngorms) and picked our way down the very steep and scree strewn slopes of the hill, to the boggy expanse which separates BIM from our next Munro, Carn Bhac. 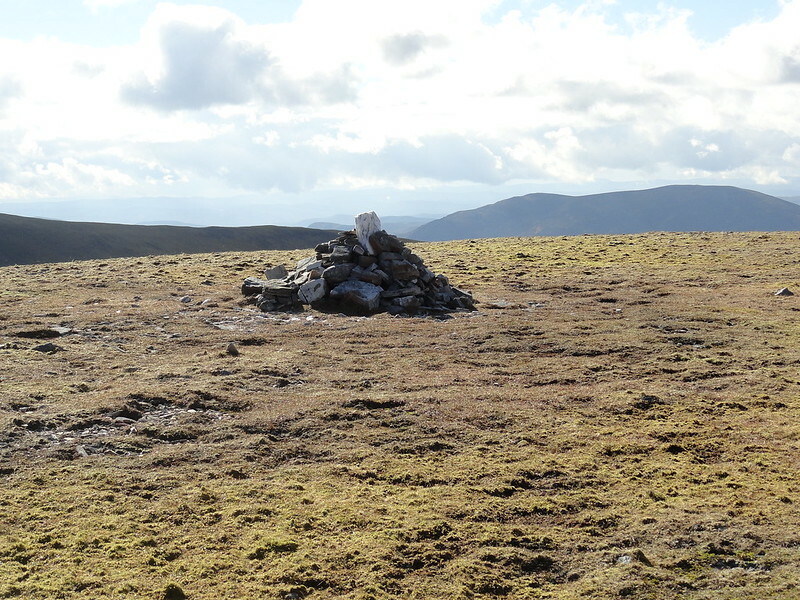 We had planned to head for the 920m bump which lies to the west of Carn Mhan and then walk the broad ridge, but the path from the easter cairn of BIM lands further east. So we struck due north across the bog, towards the Allt nan Clach Gealach. Grice, mountain hares and ptarmigans sprung out of the heather here and there! We soon reached the scree slopes of Carn Bhac. 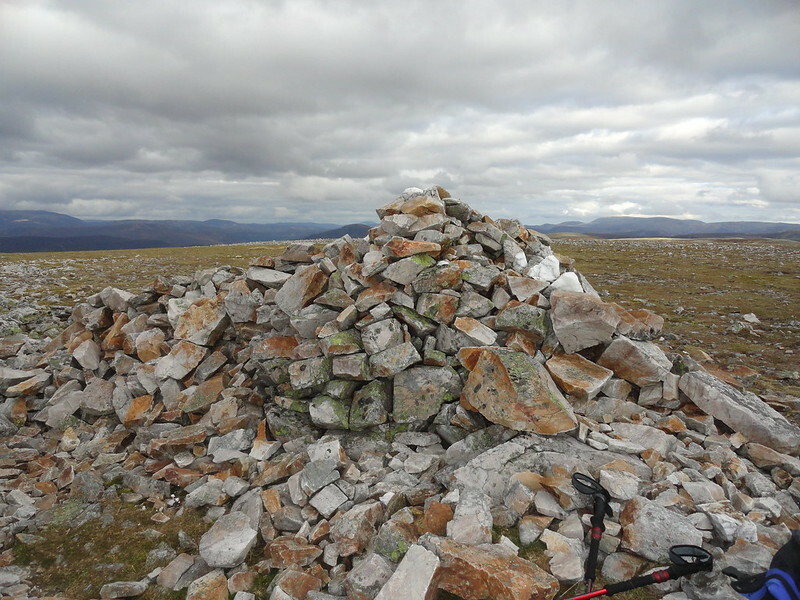 Another flat summit, this one grey with sharp sandstones, with one cairn kidding on it might be the summit and then further on two larger ones, with the one on the right being the real summit cairn. The views to the northern Cairngorms were amazing - the light being clear, we could pick the mountains in high resolution, the cliffs below Sgorr Gaoith in the far north, Braeriach, Cairn Toul, Devil's Point closest to us, then the Lairig Ghru, a marvel of glacial sculpting, Ben Macdui with the beautiful cliffs of Coire Sputan Dearg and further east Derry Cairngorm and in the far distance the stacks of Ben Avon perhaps. Fantastic panorama. To the south west lay Beinn a'Ghlo and 40 miles to the west we could discern probably Creag Meaghaidh. The return to the bikes was pretty straightforward. We just headed south and then west towards the Allt an Odhar and followed that until we reached the path. Back on the bikes, it took a little while for my sitting apparatus to get used to the saddle again but within 20 minutes I was on a high gear, and cheered on by the rutting stags, I sped along the track, my brain turning to jelly on the cobbles, at a fair clip, although Elaine who is a seasoned cyclist was well ahead of me. We were back at the car by 6pm, very chuffed with ourselves. Once we'd tethered the bikes to the nifty bike rack contraption Elaine's husband installed in the back of their Berlingo, we set off back through Braemar, Blairgowrie, to reach the A9 past Stanley and then home. 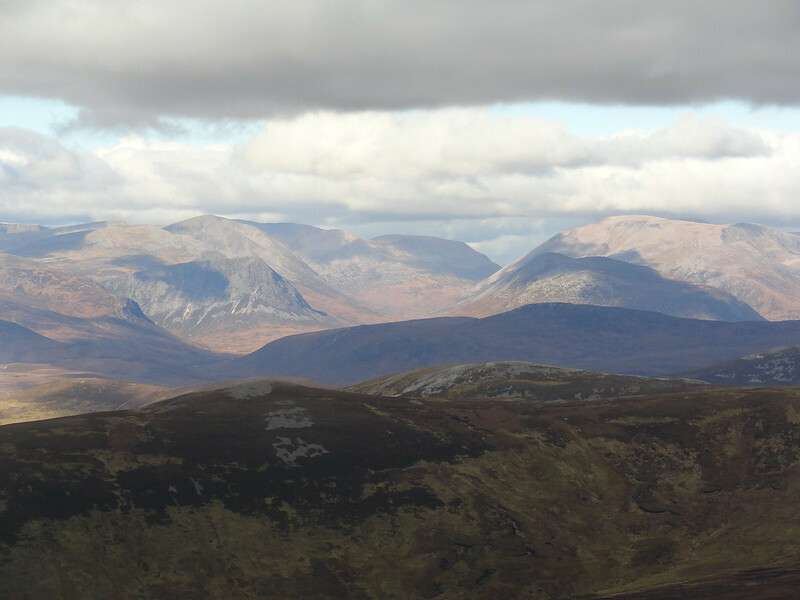 Great treat scenery well captured - love the shot of the Lairig Ghru. Wonder how much time you saved by cyling in? What a great day you picked for these! I’ve got these planned for next summer, so a handy report for me. 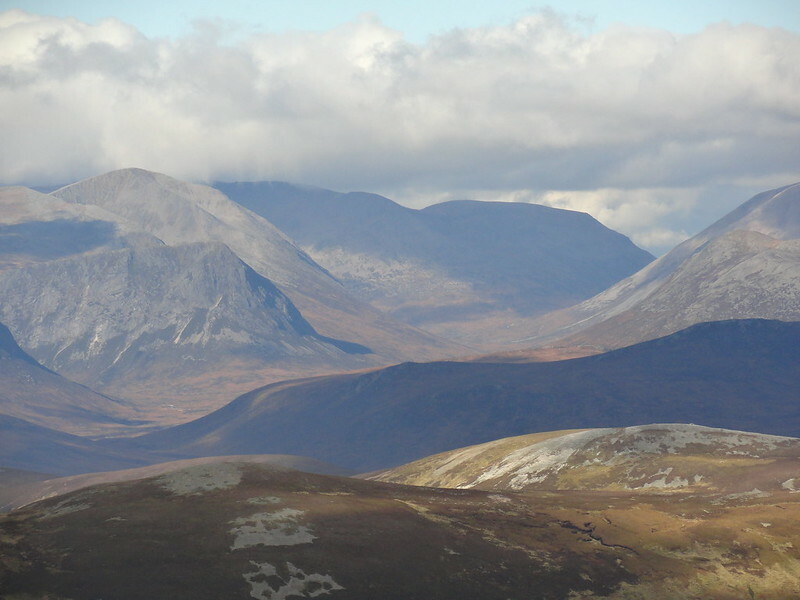 dogplodder wrote: Great treat scenery well captured - love the shot of the Lairig Ghru. It took us 70 mins to cycle there and 50 mins on the return. It's around 8.5 km so @ 12 mn per km, building in a wee bit of ascent at the start, I'd estimate it would've taken almost 2 hours to walk there and, say, 1h40 on the walk out. So we must've saved about 1h40, which is not bad. Well done Emmanuelle and Elaine. Looks like you had a fab day. Similar on Lismore on Sunday with views of so many hills made me wish I'd been with you!